Here are 5 free websites for GRE preparation designed for those who are planning to pursue their Masters or PhD from United states and other countries. These websites provide GRE sample questions, GRE practice test, help you with GRE tips, basically gives you everything related to GRE Exam. GRE (Graduate Record Examination) is a test that washes up all the energy of the students preparing for it. Below given websites for GRE preparation can help you take one step forward in achieving your career goals since they come up with GRE material, GRE study guide, GRE mock test, GRE strategies to score best during the real GRE exam. Lets get into details of each GRE website. JumboTests is one of the best online GRE test prep tools that helps you to achieve high in GRE test. 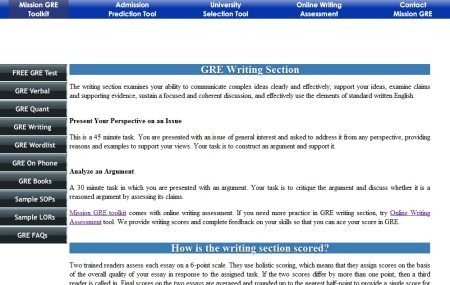 This free GRE website help you with all the 3 sections of the GRE i.e Verbal Reasoning, Quantitative Reasoning, and Analytical Writing. JumboTests brings to you 8 to 10 GRE sample questions of each topic such as, sentence completion practice, antonyms, analogy, quantitative equation problems, DI, and much more. In addition, this free GRE website also provides 6 full length GRE online tests that will help you diagnose your weak area. JumboTests is a good useful website that can prove to be an essential gateway to academic and career success. Students can also check out our featured post on GMAT Preparation. 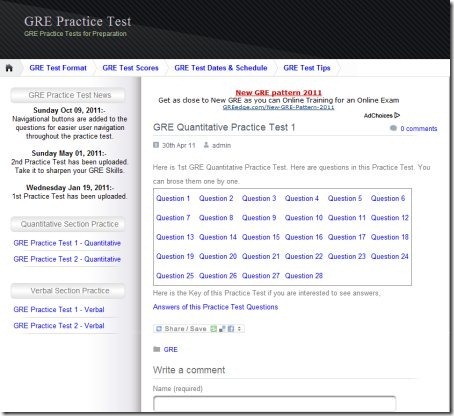 GRE Practice TGRE Practice Testest is another popular GRE website for GRE preparation that provides everything related to GRE. 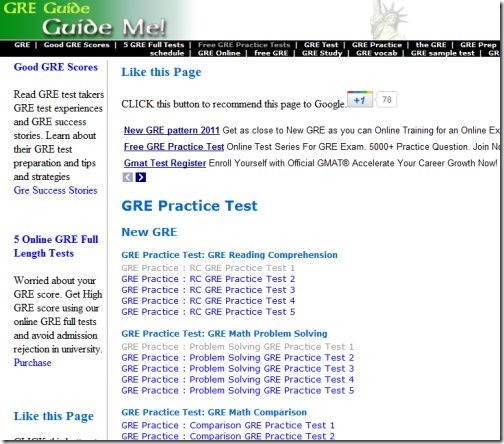 Starting from GRE Test Format, GRE Test Scores, to GRE Tips, this website gives everything required to prepare for GRE. 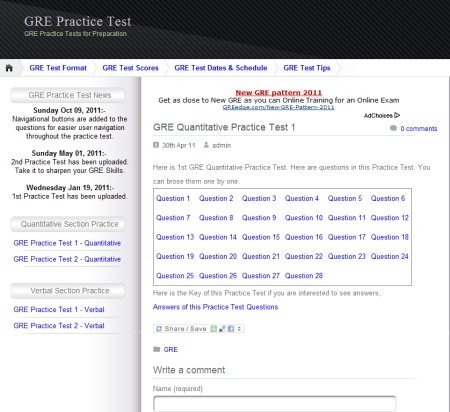 In addition, this GRE website also delivers 2 full length GRE Practice Tests, each for Quantitative Section and Verbal Section. You can also check GRE test dates & schedule. The website provides full-fledged information about GRE test dates & schedule. 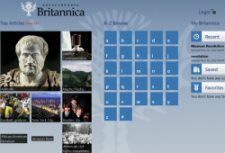 The website is extremely helpful if you practice regularly. Go ahead and start practicing. You can also check out our article on TOEFL preparation websites. Mission GRE is yet another excellent website that helps you in GRE preparation, resulting into higher GRE score. 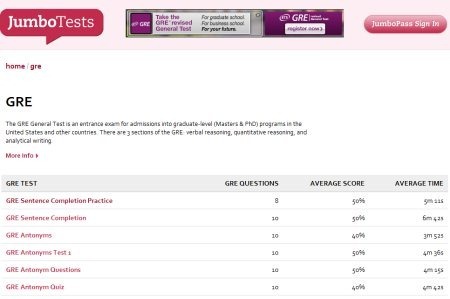 The website offers the entire GRE syllabus in different categories given at the left side of the page such as GRE Verbal, GRE Quant, GRE Writing, and much more. Clicking on any category, for example: GRE Verbal, will take you to a page where you will find everything related to GRE Verbal such as practice Antonyms, practice Sentence Completion, and so on. Apart from providing free GRE material for GRE preparation, Mission GRE also comes up with paid version of GRE material wherein you need to pay online for using paid GRE study material. 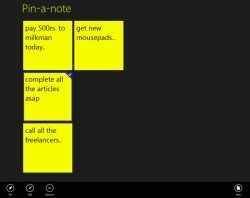 You need to sign-up for using paid version. 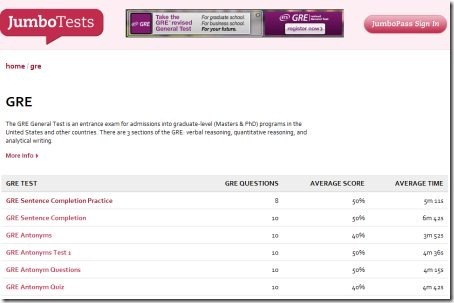 In short, Mission GRE is a good utility website to help you prepare for GRE. Go ahead and prepare for GRE..! 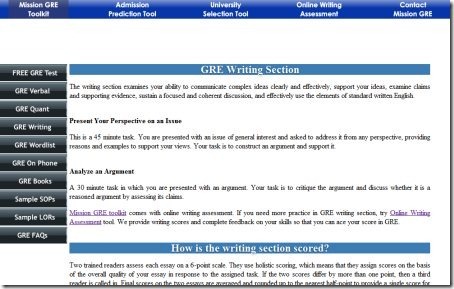 My GRE Tutor is one more GRE website that helps you to prepare for the GRE test. 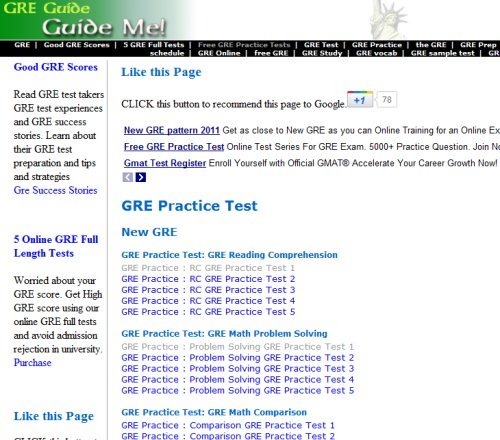 This is another website that provides everything related to GRE such as the GRE test, Maths & Verbal Review, Essays & Writing Well, Vocabulary Tutor and other GRE study guide. In order to get access with all such services, you need to register yourself with the website. Yup..there you are. Start practicing. Ending my short post with this last but definitely not the least GRE website, GREguide. This website is extremely powerful since it provides you A to Z of GRE. Starting from what is GRE to GRE exam dates, to GRE Cost, to GRE practice tests, to GRE scoring, A to Z. Apart from providing old GRE practice tests, this free website has also updated itself with new GRE practice tests. The tests have been categorized into various categories such as GRE reading comprehension, GRE math problem solving, GRE sentence completion and many more. This website is absolutely a must for each and every student preparing for GRE. It will definitely help you score best during the real GRE exam.